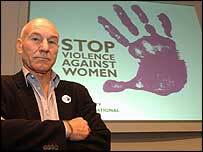 Star Trek actor Patrick Stewart has accused Hollywood of featuring "extremely irresponsible" scenes of violence directed towards women. The star was speaking out at the launch of an Amnesty International campaign on violence against women. He singled out Quentin Tarantino for particular criticism, citing Kill Bill as a "deeply offensive film". He admitted he now deeply regretted being involved in projects that sent the wrong message. "I don't want to be specific, but I have been involved in sequences both in the theatre and in film which, with hindsight, I realise were offensive because they were perpetuating a stereotype," Stewart said. "Violence against women diminishes us all. "If you fail to raise your hand in protest you are part of the problem," he added. Stewart, who starred in the Star Trek: Next Generation series and X-Men, was in London to help launch Amnesty's global Stop the Violence campaign. "The entertainment industry has been extremely irresponsible in perpetuating and stereotyping the violent attitudes of men to women," he told reporters. "It's a lazy and sensationalist approach. I condemn it entirely." Talking about Tarantino's style of movies, Stewart said: "I condemn utterly films like Kill Bill which we are told are empowering women," he said. "But they are apparently empowering women to kill other women which was the message that I took from the film." Stewart, 63, also revealed he witnessed his own father hitting his mother as a child. "It just so happens that here was an issue that I have a personal association [with] and after consultation with my brothers, we all felt that it was absolutely the right moment to speak out," he said.